Some history is lost because it is, as Brad Meltzer writes, great stories get forgotten. Elsewhere it is facts that contradict public myth. In some instances, the forgotten past is critical truth that a people, in their ignorance, risk much from what they fail to learn. Michael Kazin, a prominent historian, in his introduction to War against War demonstrates that last point. The movement for peace and opposition to World War I is not just a passing note in the history of a "forgotten war." It was a critical moment in the long history what America should become, a struggle going back to at least the non-foreign involvement line in the so-called Monroe Doctrine of 1823. Kazin does not go that far back but starts his work in the early 1900s. The peace movement by then was international and critical of America's recent war with Spain/the Philippines/China. In the United States, it brought together groups that shared little else in common except distain for the corporate interests that benefit from war. These American movements were the product of the idealism from and the condemnation of the American Civil War. Feminists rightly saw that women gained nothing but lost much by war. Progressives saw such conflict and spending as destroying society much as did alcohol and drugs. Jane Addams in her famous struggle against poverty and also the Socialists saw military spending as better used to end the worst consequences of capitalism. Politicians in both major political parties feared competing for power with those same dehumanizing entities that profit from war. So many groups fought for or against the United States participation in the war that the book would benefit from a glossary. In that era even Teddy Roosevelt received the Nobel Peace Prize. Famed philanthropist Andrew Carnegie gave $10,000,000 to establish an institution for finding a way to end war. Great writers like William James and William Hull wrote works on peace that compared that movement to the abolitionists of old and to the ideas on evolution of Darwin. President Woodrow Wilson joined the peace movement in believing that American ideals could end war for all time. He won reelection in 1916 by proclaiming that he kept the United States out of the European war that had already cost millions of lives and which was displayed in all of its gigantic gore in movie theaters. All of human history changed profoundly with the Great War of 1914–1918 and all that became what we live today followed. As the author writes, it also "touched off nearly thirty years of genocide, massacres, and armed conflict." Arguably, the only good that came from a loss of life so beyond comprehension was an international contempt for war that still failed to prevent the conflicts that followed. Well-organized and popular American groups worked hard to keep the United States officially out of the war. For three years, they fought the forces that wanted increased military expenditures for so-called "preparedness." Even after President Woodrow Wilson had passed the Espionage Act that is still used to this day to persecute alleged enemies of the state, he still brought out his famous 14 points "for a peace without conquest, if not a peace without victory." Kazin writes that "not until the movement to end the Vietnam War half a century later would there be as large, as influential, and as tactically adroit against U. S. intervention in another land." Resistance to the war continued in the United States, and in many forms, for years even after the armed conflict had ended. Despite such efforts, 2017 will be the centennial of the United States entering the First World War. Kazin points out that the "decision to join the Allies was a turning point in world history" that likely prevented instead of insuring lasting world peace. The author argues that the country "won the Great War but lost the peace." Huge profits made from loans and trade with Britain and France won out against the pacifists, feminists, Irish-Americans, German-Americans, Socialists, unions etc. Germany's leadership, however, also failed to exercise common sense with its provocations against the United States, from the Lusitania to the Zimmerman telegram. 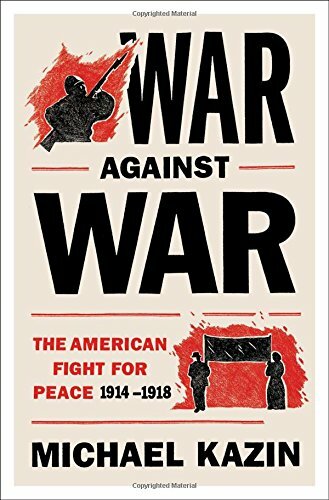 The author goes into detail in describing the dramatic political and social "battle between the pro- and anti-war camps [that] was fought on the ideological terrain of Americanism itself." He might have, however, discussed in more detail the actions taken against the war protesters, even to the extent of attacks on beer, Dachshunds, frankfurters, hamburger, and German measles as unpatriotic. The public was not always persuaded. Young men had to be drafted to create an army almost completely from scratch. Even without the peace groups, eighty percent of the men in the South, for example, applied for exemptions out of self-interest. By contrast, "most black spokespeople endorsed the war" as an opportunity toward the goal of something like civil equality. Across the country, opposition often turned to violent resistance. Despite the protections of the United States Constitution, the leaders of the American peace movement "endured the wrath of a government that punished them for refusing to change their minds." President Wilson's reputation dramatically suffered, including in Kazin's views of these events. The publishing market does not suffer from a lack of historical nonfiction, from almost useless rehashing of popular history to the most serious scholarship. War Against War stands as a model for the best such literature. It is well-written, carefully researched, and compelling scholarship. A dramatic read, this work expounds in detail on critically important parts of American history that tragically have gone forgotten and unlearned.